So many of us are chronically exhausted. We have jobs with overwhelming workloads and bosses and/or are at home taking care of the kids, elderly parents and other never-ending household responsibilities. There’s simply no denying that the pace of life continues to grow faster and more stressful. 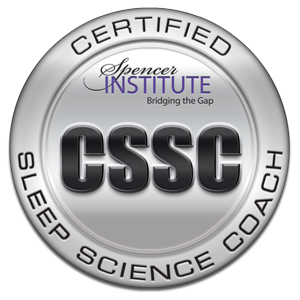 Since specializing as a Certified Sleep Science Coach, I’ve noticed inconsistencies between what people say they want when it comes to sleep success and its associated recovery benefits versus what they’re willing to contribute towards that success. Despite suffering from chronic struggles to get out of bed, to stay awake and alert by mid-day, as well as feeling wiped out in the evenings, there’s a secret flinch or hesitancy when it comes to carving out time for the full eight hours of sleep necessary to refuel, support health, and feel amazing. ► Actually,...many sleep-deprived people can grow accustomed to the exhausting side-effects of not getting enough sleep and may think they’re “fine”. ► Actually,...the life spans of people with sleep deprivation are cut shorter on average by five years. “Getting eight hours of sleep sounds great but, I have... my programs to watch; plans to go out; I don’t want to miss out on anything; I like quiet time to myself after everyone else has gone to bed”...Yada, yada, yada. ► Actually,...there’s this thing called On-Demand TV; you can go out, have fun, and still get home for 10pm; the most important thing to not miss out on is sleep; and, re-scheduling quiet Me-Time from late evenings to your daytime To-Do List can be very self-affirming. ► Actually,...having inconsistent bed and wake-up times results in a jet-lag effect and causes stress and wear-and-tear on the body. ► Actually,...blue light from a television will be communicating to your brain throughout the night that it’s daytime. No wonder why you can’t sleep. Regarding fear of the dark, I recommend exploring healing/calming modalities including vagus nerve activating breathing techniques, psycho-therapy, acupuncture, Body Talk, a weighted blanket, yoga, binaural beat therapy, HeartMath® and more. PS: A big, soft stuffed animal can go a very long way towards self-comfort! Have any questions or sleep ambivalence attitudes you’d like to share? If so, let me know. I always love to hear your comments! Also, if you’ve enjoyed this article, please share it with your family, friends, and colleagues. Thanks and blessings for a great night’s sleep and optimal health! Susan D’Addario is a Certified Sleep Science Coach and Founder of Back-To-Sleep in NYC. She helps people who are struggling to get a good night’s sleep, and aren’t able to do their best at work or at home, to finally be able to sleep soundly again so they feel rested and ready to take on the world. Are Your Sleep Challenges Due to a Rhythm Disorder?